Keeping your pens and pencils organized is important for all artist work spaces. 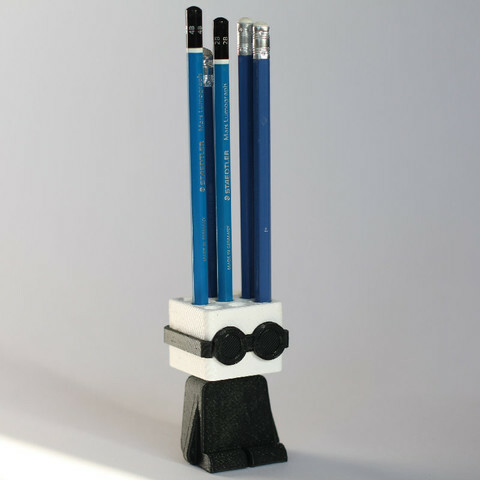 This desk toy design was inspired by Andy Warlhol's famous fashion sense and will keep your pencils all lined up for you. The project was an exploration into desktop 3D printer constraints. The desire and feasibility to combine multiple colours outputs into a single object using a consumer grade printer. The end result was a practical yet fun looking desk toy that can be printing on almost any common 3D printer. Multiple iterations where quickly designed and tested using Fusion 360. The final model was printed on a common 3D printer using two different PLA plastics at 300 microns. After printing you will need to glue the bits together. The head should fit tight to the body without any need for glue.